Bridge loans typically run for 3-12 months and are used to provide an interim funding solution for property developers to accomplish strategic near-term objectives before the main line of finance is put in place. They are secured by a first charge on the property. To provide an example, a property developer may require a bridge loan when he is applying for planning permission for a site he has purchased but cannot get a regular development loan. Instead he can take a bridge loan which, as the name suggests, covers him for the planning period. If planning permission is granted, then he would refinance with development finance or sell the site and take the profit resulting from the uplift in value from securing the planning permission. Our Bridge Loan products are secured by a first charge on the property and therefore stand first in line in the event of default. A legal charge is the means by which lenders enforce their rights to the security. The first charge status makes Bridge Loans less risky than those beneath them. The loan is typically for an amount up to a maximum of 70% of the value of the land or building in its existing state. The valuation is provided by an independent third party RICS accredited valuer. The total interest due on the loan is usually deducted from the loan monies advanced at the outset, for example if the property value is for £1m and allows for a 70% LTV loan at 10% per annum, then the actual amount the developer will receive will be £630k (70% of £1m less interest of £70k). Due to the borrower giving a first charge as security and the interest being taken upfront, Bridge Loans are a low risk investment and typically provide fixed annualised returns of 8% to 12%. They are most suitable for those investors who do not like to take too much risk and prefer the advantage of knowing exactly how much they will make, and who are looking to invest over a shorter time frame. The risk for an investor is that the borrower is unable to repay the loan, in which case it goes into default. If that happens, the land or building will be sold and the bridge loan repaid first. This will however take extra time for the investment to be returned. Please note that property investments involve risks including loss of capital, illiquidity, default of a borrower and lack of returns. 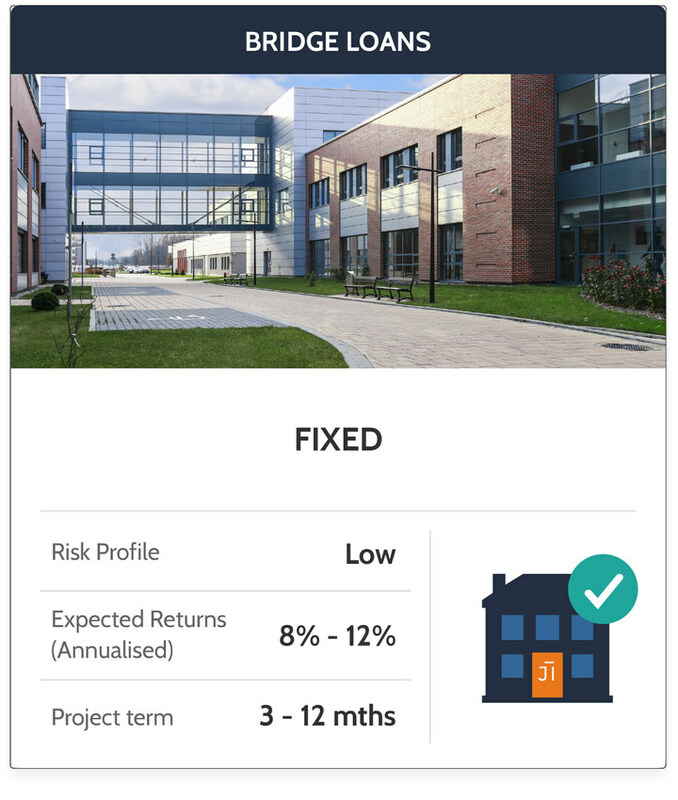 The risks involved will vary by project types, so please make sure you have read and understood the specific risks associated with the investment. Investments made on this website should only be made as part of a diversified investment portfolio. For more details, see the Key Risks. Projections or estimated returns are not a reliable indicator of actual future performance and eventual returns or dividends may be lower than predicted. Information presented on this website is for guidance purposes only and does not constitute financial advice. If you are unsure of the suitability of an investment, please contact your financial adviser for professional advice. This website is a financial promotion approved by Shojin Financial Services Limited which is authorised and regulated by the Financial Conduct Authority (FRN: 716765) (see www.fca.org.uk/register for more information). Investments made on this site are not covered by the Financial Services Compensation Scheme. The investment opportunities listed on this website are not offers to the public and can only be entered into by certain types of investors who have satisfied certain investment criteria. © 2019 Shojin Financial Services Limited. All Rights Reserved. Your capital is at risk. Please refer to Key Risks for further details. Your capital is at risk. Please refer to Key Risks. for further details. Please provide valid information for the highlighted field(s). Don't worry, we will help you get a new password. Let's start with entering your registered email address. We have sent you an email with a link that will let you create a new password. A verification email has been sent to your registered email address. Please click the link in the email to activate your Shojin account and gain access to our exciting investment opportunities. As part of FCA requirements, to view details of our investment opportunities and track record please create a Shojin account and log in.